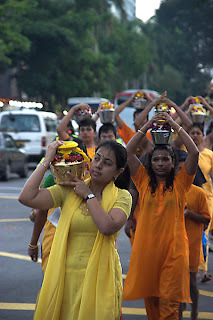 One of the most interesting festivals to witness for travellers to Singapore is the Thaipusam festival. It is a Hindu festival celebrated on the full moon in the Tamil month of Thai (Jan/Feb). 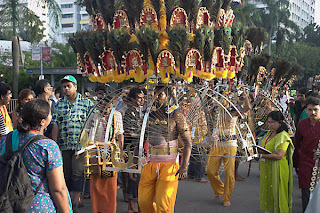 This year (2008), it was held 21-22 Jan.
Generally, participants of the celebration make an offering of a kavadi (burden) to Lord Murugan either for tiding over some misfortune or granting of some favor. This kavadi can be as simple as a pot of milk, or as elaborate as a huge altar of sorts that is pierced into the devotee. 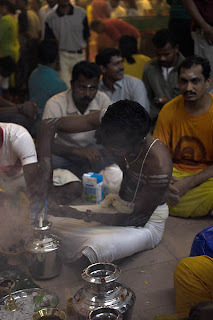 The whole process usually starts the day before , with the preparation of the kavadi and prayers and rituals at Sri Srinivasa Perumal Temple at Serangoon Rd. Then a pilgrimage is undertaken along a fixed route to Sri Thendayuthapani Temple at Tank Rd, carrying the kavadi. 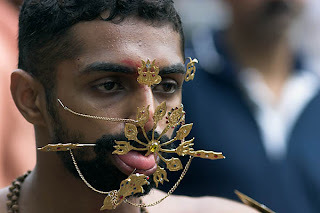 The carrying of the spiked kavadi involves alot of piercing of flesh, tongue, cheeks etc, so it is really a test of their faith and devotion. At the end of the pilgrimage at Sri Thendayuthapani, before offering to Lord Murugan, the devotees typically perform some trance like dances amidst lots of singing and prayer. Once done, they will proceed out of the temple to dismantle/remove their kavadi. The whole affair is very bonding for the devotees as the whole family will be around to give their support, and very colourful for tourists and bystanders. Of course, for those documenting the festival, respect must be given, and in no way should a person interrupt or hinder the ceremony. 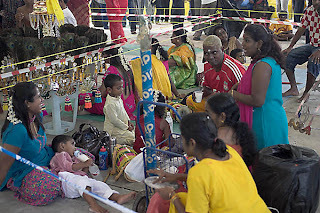 For tourists or locals alike, do check out Thaipusam!